Last edited by Eduard Klarer on Wed Feb 23, 2011 10:10 am, edited 4 times in total. Your post is beautiful; it moved me. I have always related to the Rainmaker story. Your father must have been a very special man. I have also noticed a few times now that you mention the Lake of Constance, that name is special to me. Near where I live there is a First Nation reserve called Constance Lake. It is the place of my grandson's roots. There are many stories and legends from that area and my daughter-in-law has related some to me. With the help of your post I believe I will be better able to explain BCI to her, a task I feel she is being called to do as well. Yes, I agree with Clarice. It is a privelage to see how you 'work' and look forward to your continuing thoughtful posts. Just wanted to say that when you mention above the inadequacy (even danger) of the use of Active Imagination - AI - as a method, it suddenly reminded me of something -- Stephen Spielberg made a movie called "AI" a few years ago about a boy who was not 'real', he was actually a cyborg but he had been given 'feelings'...(it was quite a sad odyssey for the boy, with all kinds of suggestions about 'what is real and what is not' etc.. - I guess kindof a modern 'pinocchio', which is interesting since Ryan and Bernie mentioned Pinocchio on another thread lately...) Anyway, "AI" also stands for 'Artificial Intelligence' it seems, so whenever I see the letters, that's exactly what I think of now ~ but then, even more crazy, when I mixed the two together and I got "Artificial Imagination" AND "Active Intelligence" ~ both of these the very opposite of the BCI, eros consciousness, approach..
Just last night I watched Steven Speilberg's Munich...and of course the memoy of A.I. came to me. Each time, I remember that movie, I re-experience how sad it is. Speilberg never really wanted to make that movie, he always felt it was Kubrik's to tell. Last edited by Eduard Klarer on Wed Feb 23, 2011 10:09 am, edited 1 time in total. Last edited by Eduard Klarer on Wed Feb 23, 2011 10:08 am, edited 1 time in total. I thought you would like to know that there is a very fine mist of rain here in the islands after a long drought. Also, I deeply appreciate your posts and I know well about the language barrier. I have 10 year olds laughing at me all the time about my spanish. I always answer..."poco a poco": little by little. That helps me now in this moment too. Last edited by Eduard Klarer on Wed Feb 23, 2011 10:06 am, edited 1 time in total. The rainmaker is drenching our island. We are in the middle of a storm and all night in my dreams I was scooping water from our terraza to the garden below...And of course this was become a reality the tube that allows the water to fall has become blocked. I've been scooping for real and watching my son while my wife is away on a trip. You should see the craziness...my son loves it though. Last edited by Eduard Klarer on Wed Feb 23, 2011 10:28 am, edited 1 time in total. I am here in the space less, timeless, matter less. That means, I can ask questions, place problems, expose indispositions, diseases, feelings, sensations and I immediately (all of a sudden) I receive pictures (films) as answers. This actually happened to me today. And I was surprised by how direct the answer was. Only by reading your post did I know that this was possible. Thank you. Last edited by Eduard Klarer on Wed Feb 23, 2011 10:31 am, edited 1 time in total. Thank you Eduard for all that beauty. The cure exists where you are welcomed in perhaps, and nature never turned anyone away! I just read my notes on the tree and afterwoods your tree BCI. Here is what I wrote about it in my comments on Carl Jung's work Transformations and Symbols of the Libido, the early form of CW 5, Symbols of Transformation. In Chapter IV Carl Jung amplifies and interprets the second poem of Miss Miller. The state in which this poem was produced is very typical for the somnambulistic state. She writes: “My weariness on the railway was so great that I could hardly sleep an hour.” After a very restless night, obviously with alternating states of being awake and in light sleep she realizes a moth flying against the light of her compartiment. “She then tried to go to sleep again,” and suddenly “the following poem took possession of her mind:” <Zit. Transformations, p. 87>. I longed for thee when first I crawled to consciousness. My dreams were all of thee when in the chrysalis I lay. Against some feeble spark once caught from thee. One raptured glance, I’ll die content. Have in his perfect splendour once beheld. As we just will realize, Carl Jung stresses especially the aspect of the moth burning in the sun and doesn’t consider the first motif of the poem, the chrysalis state of the moth. I would however like to include this very important aspect of the poem, which talks of a metamorphosis, a transmutation of the caterpilar into the insect, of which the chrysalis is the necessary intermediary state. During this completely motionless state the body of the caterpillar is completely dissolved, and reorganizes itself to a new being, the butterfly. Symbolically seen the state of the chrysalis is comparable with the state of somnambulism, in which the body can even become catatonic (as in the case of Helly). In Egyptian mythology we find this motif in the fragmentation <dismemberment?> of Osiris by his hostile brother Seth. In the continuation of the myth Osiris’ sister Isis looks for the parts of Osiris’ body and assembles <defragments? composes? re-assembles?> it anew. However – and for my further investigations this detail is decisive – she does not find the phallus of Osiris anymore, and thus replaces it by a wooden <one?>. Since “wood” and “tree,” belong to the (motionless) vegetation and thus are symbols which point to vegetative processes, we realize that a completely vegetative procedure is meant. There is thus a great likelihood that the process constellated in Miss Miller actually talks of a process happening in the vegetative (sympathetic/parasympathetic) nervous system . Your experience showed me further how different to Carl Jung I begin to see the world ... Hermetic instead of Neoplatonic. What this means I will show in my comments about Carl Jung's book. I see however more and more that instead of suffering consciously he "sublimated" his abandoning of his relationship to Sabina Spielrein-- and this seems to be the biggest problem of all this psychotherapy circus. Transformations is a very confusing book, since Jung always tries to interpret the Miss Miller material in a Neoplatonic way -- out of evil matter the good spirit must be sublimated -- but in his amplifications always falls back into Hermetic symbolism -- we must stop thinking and let us fall into our body or into nature (Eduard's BCI above! ), and then the world soul can create Her acausal creations out of the unus mundus. Thus, the book shows this unconscious split in Jung. Last edited by Eduard Klarer on Wed Feb 23, 2011 10:32 am, edited 1 time in total. The Tao story is one of my favorites - I'd forgotten that it came from Richard Wilhelm. But enjoyed this whole passage. As an Irish person I also find it interesting how Swiss and Germans have these encounters - Wilhelm & Jung in particular. 25 years ago I had a job in NY of editing a ten or so volume work of James Joyce's works in photocopied manuscripts. All of our best editors were Germans: I was impressed on how they "managed rumination" - Irish people like myself very often get lost in the woods or live happily there and never come back out. Germans bring something back (much as Heinrich Herrer was the first to introduce the Dalai Lama to the West). "Those of old who were good at being knight-scholars were subtle, were possesed of ineffable efficacy, and were in dark and mysterious confluence, so profound that they could not be perceived . . . ." (Pat Moran, translation.) Lao Tsu mourned the passing of these individuals, forcing the writing down of things which they had known inately ('entered time" and politics; Tao te Ching is said to be a dissident view of the Confusion position). Ten years back I began watching closely the reconnecting of the European "circle" under 12 stars and a new flag and the German anthem, "Ode to Joy." Because at the center of Europe was the the symbol which is the Flag of Switzerland, which is an exact "introvert" of the Kights Templar's symbol. Jung's great vision of the fountain in Liverpool and "another Swiss" also suggests the Self, and the second rider on horseback. 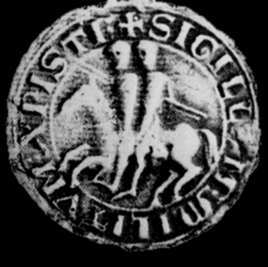 I think I mentioned before I once had a dream of two on a horse coming to my "castle" and thereafter researched the symbol and was led to the Templar lore. The horse (white?) was pointing to the right (positive number: "into the world") and the rider on front was John Lennon. The rider behind was a shadow. I felt it was yin. 13 years ago. Then also I began to research John Lennon. Interesting, my name, Bernard, I learned was from the French St. who "housed" the Templars. Last edited by Eduard Klarer on Wed Feb 23, 2011 10:33 am, edited 2 times in total. The sapphire is the same mineral as the ruby, just a little iron mixed in. Last edited by Eduard Klarer on Wed Feb 23, 2011 10:34 am, edited 1 time in total. Last edited by Eduard Klarer on Wed Feb 23, 2011 10:34 am, edited 2 times in total. Last edited by Eduard Klarer on Wed Feb 23, 2011 10:36 am, edited 3 times in total. Last edited by Eduard Klarer on Wed Feb 23, 2011 10:37 am, edited 1 time in total. Many thanks for continuing to include us in the insights re. your process. An inclination regarding my head came the other day: I must accept it is a PART of my body - it must not float above and away to live alone, all by itself. Of this I must however continually 'remind' myself...it is amazing how the head tries to escape! First I continued to subtract it from my body completely -- decapitation many times! -- along with all of its' games and needs etc. After each of these separate 'removals' it of course returned back to the body again. I realized -- watch/listen and make sure that it does not start to act 'separately' again, that is the trick! To become, however, relaxed about all this is difficult. The irony is that if one is not relaxed the process does not work as well, and you so clearly show through your surrender to the BCI process that relaxation matters very much! To help with relaxation I 'picture' my body from the outside - just imagine a soft outline of the WHOLE body, like an aura, with my head as a integral part -- all parts together (if however I just think about myself again, without 'viewing' my body as a whole like this, then usually I notice that I have, once more, started to consider my head as completely alone and without any reference to the body...) . I guess the neck is the 'bridge zone' (one can perhaps begin to see how potentially important the throat chakra might be for this process--). The question is: do we even consider our necks, which are at one end of the (fantastic) spine and which serve to attach the head to the body? wow.... When the neck is in pain, can this almost at first be considered a sort of psychic strain (which then becomes physical), the strain imposed by the wayward head, which considers itself at times so separate and lordly? Many thanks BTW for noting that the BCI (inner meditative) process does NOT always accept whatever first symbol or image we 'choose' for transformation -- this seems a hugely important insight. Things happen when we go 'inside' that must be allowed to move/morph in their own way...magic steps in where we let go.. Thank you both for sharing your experiences, Eduard and Kristin. Last edited by Eduard Klarer on Wed Feb 23, 2011 10:38 am, edited 1 time in total. Last edited by Eduard Klarer on Wed Feb 23, 2011 10:39 am, edited 1 time in total. Last edited by Eduard Klarer on Wed Feb 23, 2011 10:40 am, edited 1 time in total. For a long time I took the view that the aim of life would be the death. Thereon I learned that here (in the daily life) there is the task to build up the individual vegetative body (subtle body). But now comes the experience, the insight, the empirical knowledge that the aim is not to waft away into the beyond (for instance in my case into the picture of the other side of the/my river, flow of life, where Eduard 2 is “living”) but that the aim and duty is the coniunctio. That means “it” should be a fertilising function from this side into the beyond and from the beyond into this side of being. Yes Eduard, I completely share this with you.